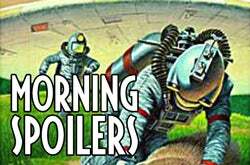 Welcome to another batch of Morning Spoilers. I've been somewhat amazed by how accurate our spoilers have been lately, for "Secret Invasion" as well as for Battlestar and Doctor Who. It just proves that the internet is more reliable than people give it credit for. This morning, there are photos of the Dragonball movie which the studio tried to suppress. Plus a featurette on the making of Incredible Hulk, and new pics and spoilers for Doctor Who. Also, find out whose childhood we'll be exploring on Lost. And there are new descriptions of every upcoming Battlestar Galactica episode. Consider yourself spoiler warned! Some more spoilers for the eleventh Lost episode of the season, where we witness the birth of Locke. Not only is grown-up Locke there, but so is Matthew Abaddon, Widmore's underling who organized the freighter trip. And there's a scene in the 1950s or 1960s where a six-year-old girl runs out in the street and gets run over. Also, we see a teenage Locke in the 1950s, arguing with his schoolteacher about whether science is really valid. Locke's high school team is the Cowin Heights Knights. Meanwhile, Sun, Jin, Farraday and Charlotte wander the jungle, and there's a mysterous Dharma doorway. "Six of One" - Conflict and mistrust torment humans and Cylons alike, as both sides struggle to understand their respective mythologies - one rooted on Earth, the other in the mysteries of the Final Five. "The Ties that Bind" - With Kara Thrace piloting a lone freighter in her desperate search for Earth, political intrigue and marital discord aboard the Galactica are paralleled by deep rifts in the Cylons' solidarity. "Escape Velocity" - Religious freedom is debated and defended as the messianic Gaius Baltar promotes his belief in one true God. "The Road Less Travelled" - The prospect of a truce between humanity and the Cylons encourages Starbuck to trust an old enemy. "Faith" - The cancer-stricken President Laura Roslin and hotheaded pilot Kara Thrace both must make difficult leaps of faith in order to accept an uneasy alliance with the Cylons. "Guess What's Coming to Dinner" - President Roslin's leadership is tested as the Galactica teams up with Cylon rebels in a plot to destroy the enemy's vital Resurrection Hub. "Sine Qua Non" - President Roslin's abduction by the Cylon Hybrid triggers a bitter power struggle within the Colonial fleet. "The Hub" - In pursuit of the enemy's Resurrection Hub, a misfit team of Viper pilots and Cylon rebels become uneasy collaborators as they formulate a battle plan. "Revelations" - A band of rebel Cylons holds President Roslin hostage while attempting to lure the Final Five out of hiding inside the Galactica and the human fleet. "Untitled" - Starbuck learns that the dire predictions of the Cylon Hybrid might be true, and a devastating discovery plunges the fleet into chaos and despair.